The third and final Wolverine movie, Logan, really wants you to know about it with a steady stream of teaser images. Now, finally, we have the man himself. Director James Mangold has tweeted this image our showing a grizzled, older Logan with scars suggesting he doesn't heal quite so well in his old age. On top of that Wolverine himself, Hugh Jackman, has tweeted this teaser out, promising a later trailer today. And, finally, these set images have been tweeted out, showing not only an old Professor X, but also Logan with a young girl. We've already seen a poster of Wolverine holding hands with a child, so this might be her. The female Wolverine clone X-23 is strongly rumoured to appear in this film so either she's going to be younger than in the comics or there's a bit of a jump ahead in time at some point. 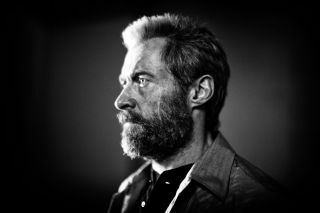 Directed by James Mangold and starring Hugh Jackman, Patrick Stewart, and Boyd Holbrook, Richard E. Grant, and Elizabeth Rodriguez, Logan will be released in cinemas on March 3, 2017.